With utmost attention given to EVERY DETAIL in the renovation of this CHARMING and STYLISH c. 1860's origin Cottage, this home is truly a One-of-a-Kind WORK OF ART! It is stunning from its exquisite chandeliers & wall sconces, Eight Foot tall doors, heated marble floors and large ceiling Medallions with gold leaf trim to its Tongue and groove Vaulted Ceilings, Fan lights, New England Rock Maple Crown Moldings, Tubular skylights and Venetian plaster wall finishes! No doubt...It is GRAND in STYLE & ELEGANCE! There are wood floors, Recessed lighting, Crown Moldings throughout and a most beautiful mantled Fireplace in the spacious living room all creating the setting for the graceful Southern ambiance of this Home. The Master Bedroom assures one peaceful and restful sleep! It is soothing, inviting and cozy with Vaulted ceiling, Upstairs LOFT and Double French doors leading to private covered porch.... Master bath has jetted tub with honed-marble wall surround, heated floors, & wall sconces. The Guest Bedroom is just as inviting hosting polished venetian plaster wall finishes with white satin trim, lovely wall sconces, two closets with french mirrored doors and private bath! The kitchen is bright & SUNNY flooded with natural light.... exposed ceiling beams have up lighting and window seats grace the bank of windows. Time spent here is a joy! Kitchen is complete with Jenn-Air downdraft electric range, two-drawer dishwasher and custom inlaid oak counter tops. 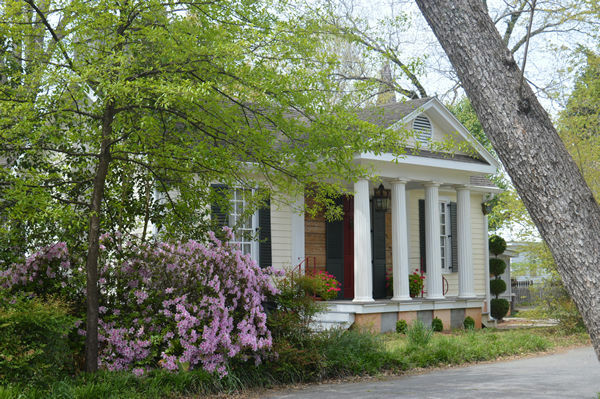 The four fluted columns on the front porch of this Charming Cottage are from the Ansley Golf Club in Atlanta and the 3 sets of front shutters are from the Abreau-Goodrum House at 320 West Paces Ferry Road, Atlanta. There is also a detached garage with workshop. 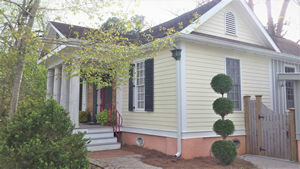 The Cottage is nestled on .18 acre lot amid Episcopal Way (across from Fellowship Hall & Robert Toombs House Museum in the Historic District) and referred to lovingly by its current owner as located on "Jesus Way". 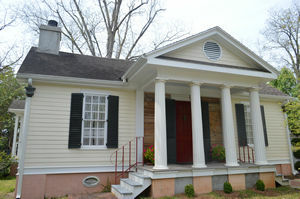 This is an absolutely AWESOME...MUST SEE property! Overflowing with GRANDEUR STYLE & ELEGANCE! 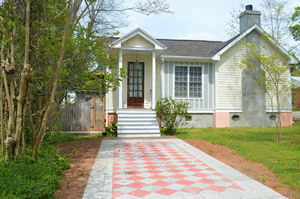 Call or email TODAY for PRIVATE SHOWING & Pricing.